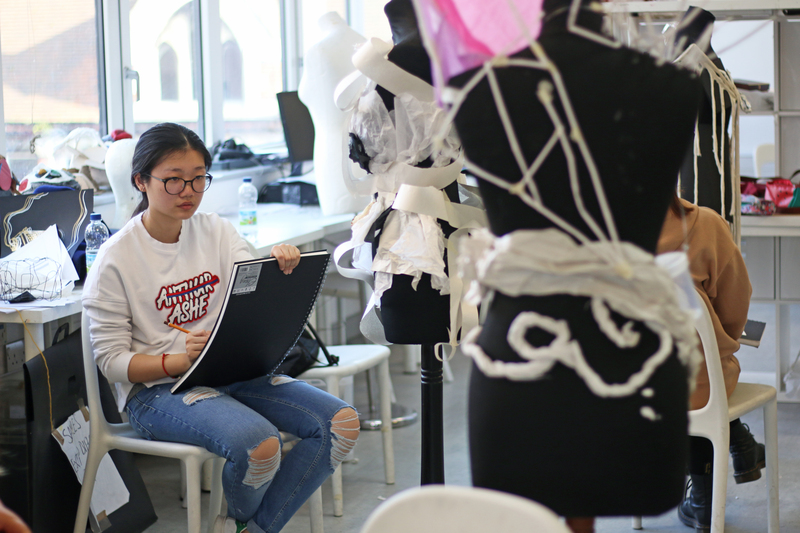 In preparation for their final pieces, Fine Art Lecturer and Artist Issam Kourbaj and Art and Design Lecturer and Artist Sam Race, put together a workshop which would help their students explore different crafting techniques to create a 'body extension'. The aim of the project was for the students to design and create a piece which was sculptural, dynamic and asymmetric. The tutors wanted the students to move away from regular designs and have things extending off the body. This workshop was also put on for 2nd year students, where it got such a great response that they wanted the 1st year students to experience it too! In the workshop, Issam first got his group to get into groups of three. In these groups, two were assigned as the artists and one was the model. 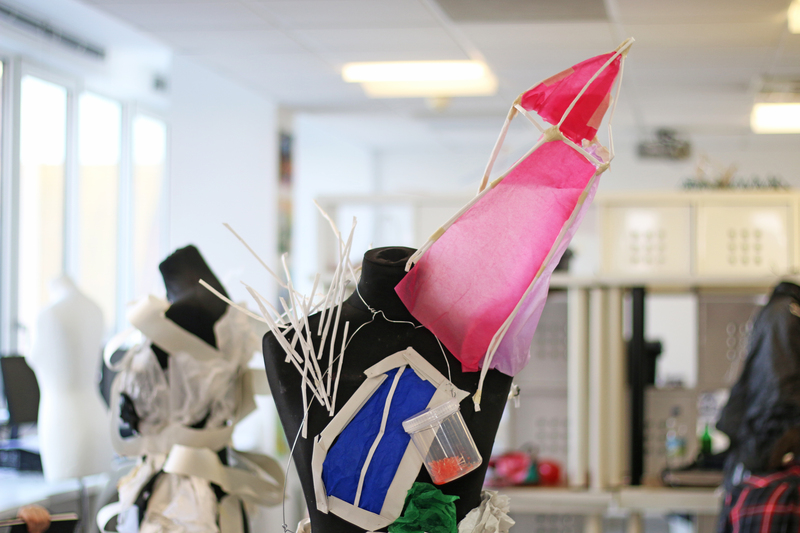 They were then given time to dress the ‘model’ in various materials and with zero influence from the tutor. This way, the students were encouraged to do whatever sprung to mind. Once the model was "dressed with their new exaction" they then took it in turns to switch positions so they all experienced the role of the artist and model. Issam stressed that they were able to dress each other in whatever they wanted, to encourage creativity and free expression. 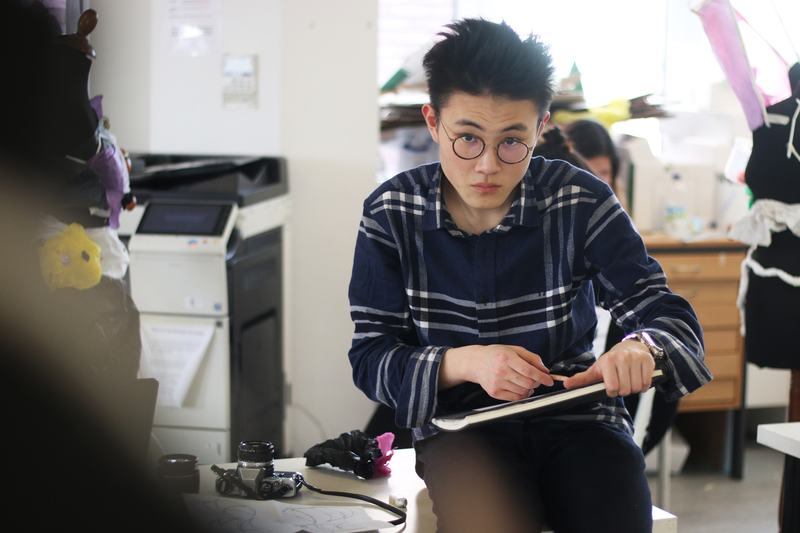 Before this workshop, Lecturer Sam Race introduced the group to drawing techniques and how to go about choosing the materials for their pieces. Here he got the students to sketch their chosen objects and the piece which they wanted to create prior to making it on the mannequin. These drawing approaches included a broad range from tonal techniques to linear techniques, see image. The object they had to choose was either a man-made item or a natural object. 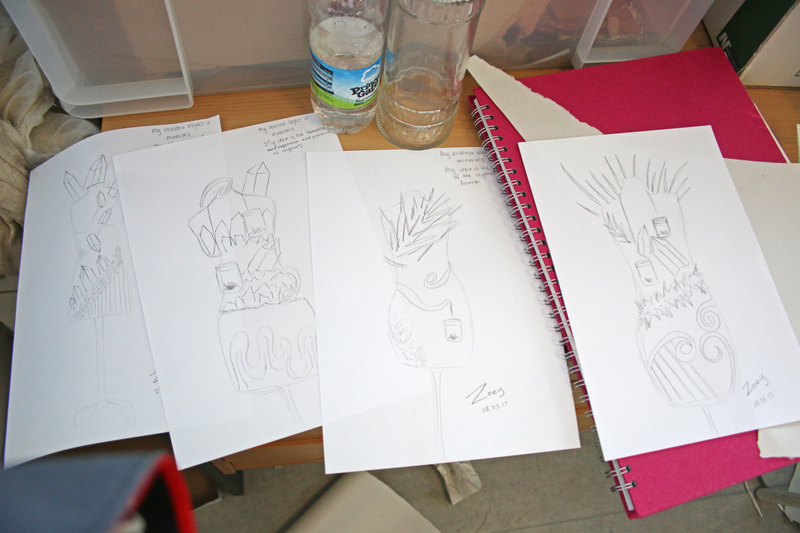 By drawing the item separate to the design piece, the students were able to draw and relate to the object in aid of understanding it in its entirety, before creating their pieces. One student chose to base his design on the aperture of a camera. Here he decided to use hard cardboard to mimic the material of the camera’s shutters. Two other students drew inspiration from jelly fish and natural crystals. It was certainly interesting to see their drawings come to life on the mannequin, and whether they were able to recreate what they had drawn. After a short break, which the eager students used to work on their pieces a little more, they were then asked to stop and prepare to draw their pieces. Issam asked for two drawings from two different angles. 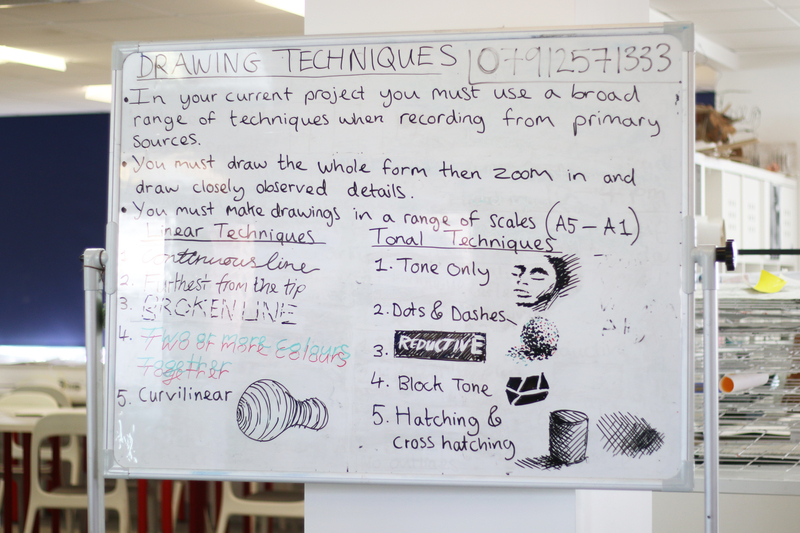 By sketching their idea, creating it on the mannequin and then drawing their piece from life, allowed students to see their overall development. By drawing their mannnequin design it also introduced them to Life Drawing, where Issam encouraged the students to draw the relationship between the mannequin and the piece. This emphasised that everything has a relationship. Any form of experimentation is great for the students. These tasks allowed them to play with their imagination and experience urgency. For example, they would usually have a week or two to come up with a concept but today they were asked to design something quickly. This added pressure gave them great practise in coming up with ideas quickly. Issam expressed that ‘the urgency makes you have to squeeze your imagination’. 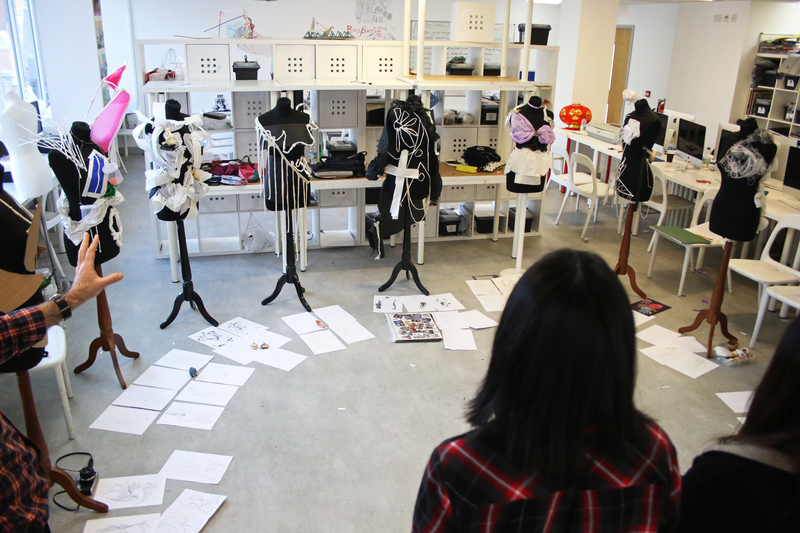 Once the two drawings were completed for their portfolios, the students showcased their mannequin pieces to the group. Here they displayed them in front of the whole group and presented what their piece was inspired by and why they used certain materials. Each student then picked someone else's design and explained why they had picked it and what they liked about it. Overall, it was great to see the students so enthusiastic about this workshop, giving each other great feedback and experimenting with unusual materials to come up with an imaginative design. We hope that they may apply these new techniques to their next project! Look at your drawing from a distance, it will look different close up. We need to be both the speaker and the listener.